I wasn't going to get this month's Glossybox (OK last month's), but I had a coupon to get this box for only $16, so I couldn't pass up that deal! I am excited for next month's Glossybox for Bergdorf Goodman box which has an incredible value, I plan on getting more than one. I just hope I can get them before they sell out! Glossybox seems to always have shipping issues every month, but this month they apparently moved their warehouse, which they say will make shipping times shorter. We'll see how that plays out for May, but this box arrived in 5 days, and it was shipped via USPS from Kentucky to California. 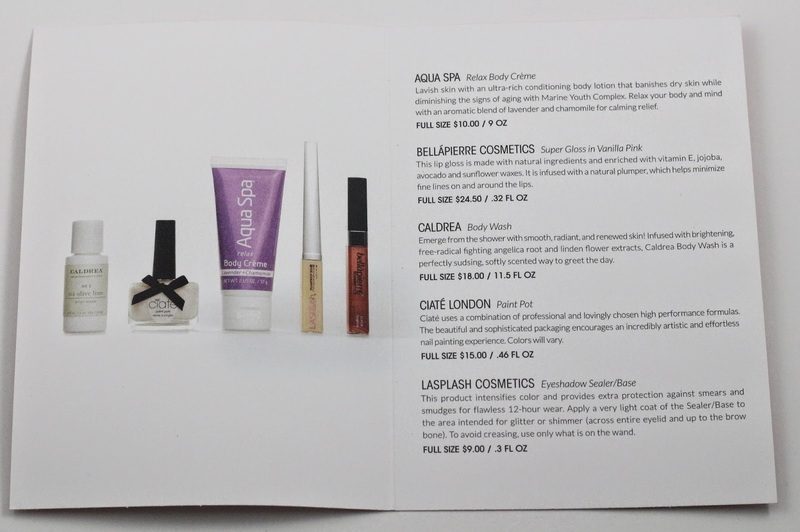 Usually Glossybox includes the info card with the correct colors of products you got, but maybe they aren't doing that anymore. I didn't get the nail polish in white, but at least there's info on here for all the products. 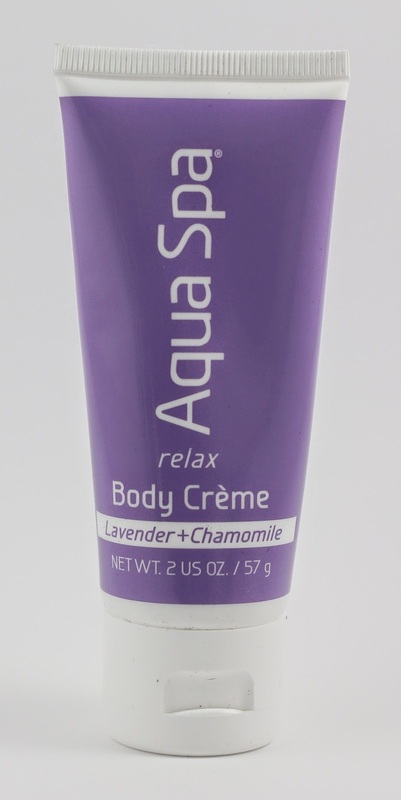 Aqua Spa Relax Body Creme - ($2.25) So this does smell nice, but the included a coupon with it advertising this product at Walmart...Glossybox do not send me items sold at Walmart. I don't shop there and I never will. You're supposed to be known for higher end brands. That just ticks me off to no end. Bellapierre Cosmetics Super Gloss in Vanilla Pink - ($24) It smells nice and I like the color, but there's really nothing special about this lip gloss, certainly nothing to warrant the $24 price tag. Lasplash Cosmetics Eyeshadow Sealer/Base - ($9) I'll probably try using this as a primer and see how it works for me. Currently I don't really have an eyeshadow primer so if this works as one I'll take it. 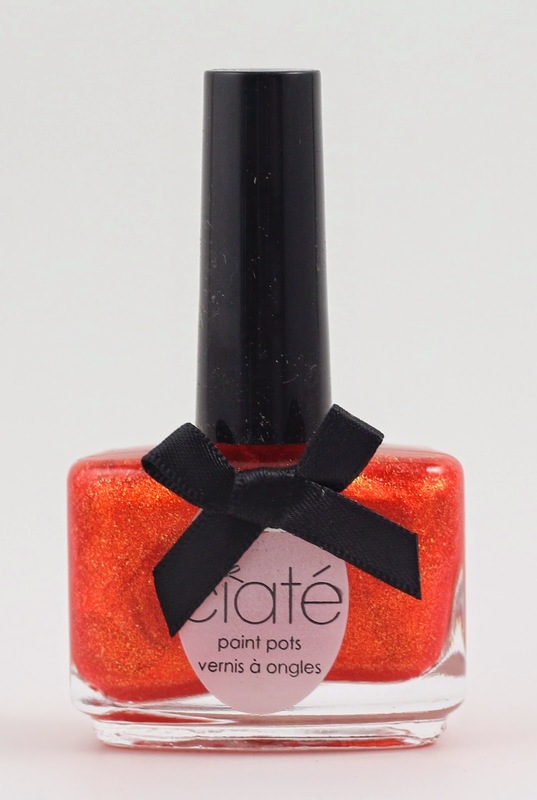 Ciate London Paint Pot in Skinny Dip - ($15) I get the feeling when the released this item as a spoiler they mostly had the red, orange, yellow color selection they originally showed. Then people weren't subscribing after the spoiler, so they were like "No, wait please give us your money we have other colors!" Then people subscribed and I barely saw anyone's box with any of the pretty colors they showed for the second spoiler. Most everyone seems to have gotten orange or yellow. I swatched this, but I may try swapping it, it's just not my thing and would look better on someone with a darker skin tone than me. Caldrea Body Wash in Tea Olive Lime - ($1.50) This smells nice and will get used, but it's more body wash. Body wash to me isn't all that exciting. Either it smells nice or it doesn't and if it doesn't I won't use it or buy it. That's it. There's no real science to making a good body wash. Overall, April's Glossybox had a total value of $51.75 which is pretty good compared to the $16 I paid for this box. This was my least favorite Glossybox to date though, and if it weren't for that amazing looking Glossybox for Bergdorf Goodman box next month, I would probably quit. But I've seen how huge a value next month will be and I'll be resubscribing and definitely getting a few gift boxes! Which, if you don't know, once you're subscribed to Glossybox you can buy one time gift boxes for only $15 each, and get them sent to yourself! And the $25 Bergdorf Goodman gift card that's included in every one, can be stacked up to 5 gift cards in one order! It's going to be such an amazing value, I highly recommend you subscribe for next month! 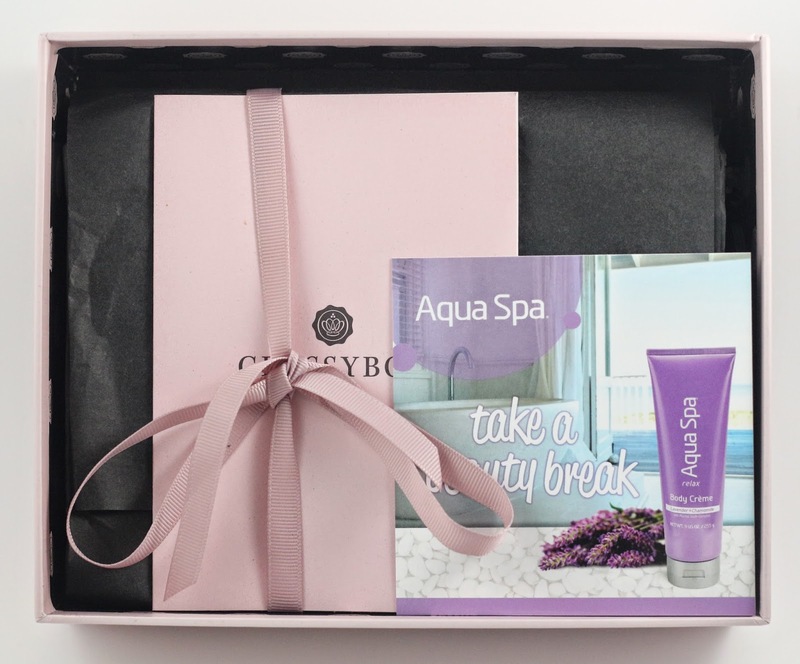 Glossybox is $21 for a Monthly Subscription and if you subscribe now, you'll be getting May's special Glossybox for Bergdorf Goodman box, along with $25 to Bergdorf Goodman gift card inside every one! What do you think of the April Glossybox? Let me know in the comments!